Fiberglass tape is great for canoe and kayak projects due to its thinness, and is also often used for taping seams and providing structural reinforcement. The fact that you can buy fiberglass tape in 2,3,4,6 etc inch wide rolls makes projects so much easier. Lightweight fiberglass material makes this tape easily conformable to every shape. Fiberglass cloth tape is made of twisted strands of fiberglass that are woven at right angles to one another. Cloth has the highest glass-to-resin ratio and strength of all fiberglass materials. Fiberglass tape is usually a narrow, cloth strip with woven edges that prevent unraveling. Use this tape for reinforcing seams and corners, and over epoxy fillets on plywood stitch and glue boats. 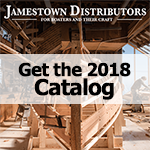 Jamestown Distributors has recently added a variety of other composite tapes. Beyond Fiberglass Tape, we also carry Carbon Fiber, Biaxial, and Fiberglass Mat Tape.